Elderhaus provides holistic and therapeutic daytime care to seniors and adults with disabilities in a safe, engaging environment tailored to their needs. Our participants, whether seniors or adults over 18 years old with disabilities and including all income levels, have an engaging, safe daytime environment that fosters an enhanced sense of self and of community belonging. Our caregivers have the freedom to adjust to their new normal, be productive, and experience less stress. Fall has arrived and with it the beauty of this season. The leaves at Elderhaus are turning and the garden is shutting down for the winter. 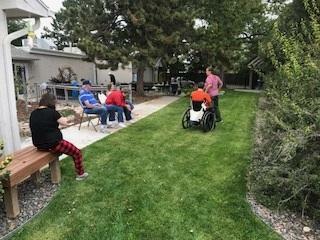 This summer, we have enjoyed using our recently landscaped courtyard (thanks to some volunteers and Evergreen Landscaping), spending time outside and even hosting a wedding and some meetings of local organizations. If you would like to use our facility on the off-hours, please contact Executive Director Joanne Vande Walle to arrange. We love to share this beautiful place with the community. 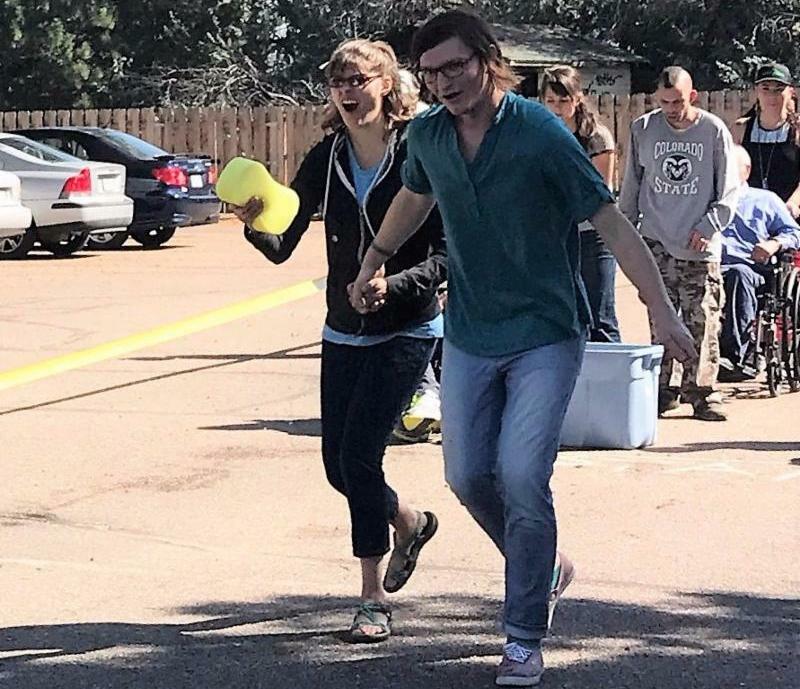 On June 30, Elderhaus hosted a community event to introduce The Next 50 Initiative to Northern Colorado. Guests from many agencies came to network and get to know this new organization dedicated to funding initiatives to improve community services for the elderly population and caregivers in Colorado. We welcome Next 50 and look forward to seeing innovative dreams become realities for Colorado because of them. We are excited to see the growth in our program, clearly driven by the need for adult day services in the Northern Colorado community. We are indebted to each of you for your support that enables us to provide the quality of services you expect from Elderhaus and Mindset. Our heartfelt thanks to the many individual donors and to the ongoing support from the cities of Fort Collins and Loveland, Larimer County, and the recent support of The AV Hunter Trust, to name a few. Your generosity enables the many events that take place here on a regular basis. Call me if you would like to visit about why Elderhaus is important to you. Our 2017 Challenge Campaign will be opening soon. Stay tuned! And speaking of these events, the fall is loaded with activities from nature trips to Estes Park to see the beautiful leaves and hopefully hear the elk bugle, to a trip to the Wild Animal Sanctuary in Keenesburg, to a visit to the Shambhala Mountain Center. We invite you to share with us our USO Show on Friday, November 10 at 1:30pm and our Thanksgiving Dinner on Friday, November 17 at noon, both at Council Tree Covenant Church, 4825 S Lemay Ave, Fort Collins. Both events are open to the community. Please RSVP to Elderhaus (970-221-0406) if you can join us. Our 2017 Olympics was a great event! Everyone was a winner! Jessica Mossman has recently taken on the responsibilities of the Activities Director at Elderhaus. She is an incredible asset to our team and we want you to get to know her. Jessica attended a total of 6 years of college starting while still in high school. 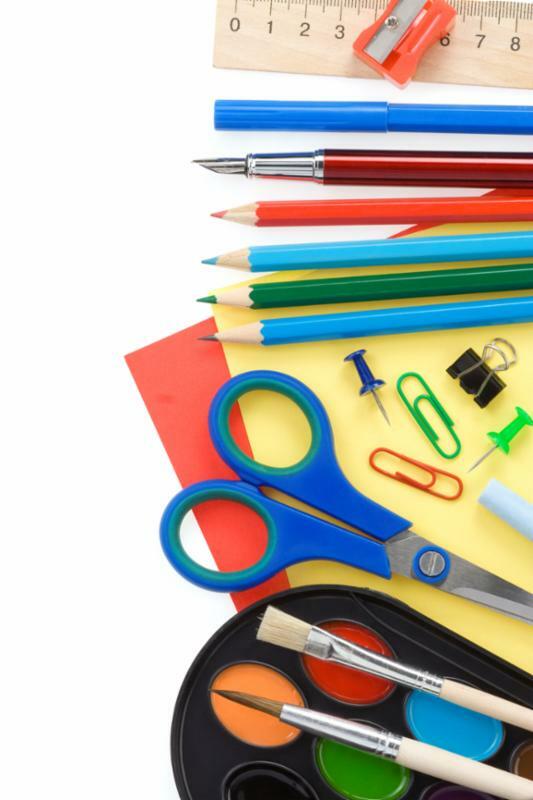 This education, plus her experience as a department manager, store safety chairman, and back up merchandiser for 7 years at a grocery chain, has prepared her for the role of Activity Director. During her last year working in the grocery industry, her father was killed in a freak accident on the family ranch. In her own words, "This made me start questioning everything, including asking if my work is meaningful." In the months that followed, she ended up with a severe workplace back injury. After months of physical therapy and rest, she no longer could physically do the job and left the grocery business to do some soul searching. 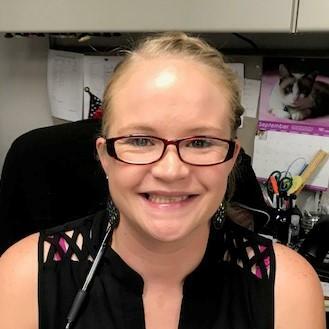 Again, in her words, "I came across Elderhaus while at the Workforce center and quickly made it my number one choice for on-the-job training. I volunteered as a workforce intern for about four and a half months before I was hired on as staff. During my internship I attended first aid training at the Senior Center, and was soon hired as a program director at Elderhaus. Shortly after starting, Elderhaus sent me through the QMAP (Qualified Medication Administration Personnel) training and the Developmentally Disabled QMAP training. I worked as a program director for about two years before being promoted to my current position as Activity Director. Elderhaus is important to me because it is such a rewarding and meaningful place to work. Characteristics of so many of our participants remind me of my father and I feel so blessed to get the chance to spend time with them since I was unable to spend more time with Dad. For the first time in my life I feel like I have found my calling and that I am right where God and Dad want me. Thank you so much for the opportunity to be a part of this incredible organization!" Welcome to your new role, Jessica! The Brain Benders program of Mindset, led by Bev Arellano, is a therapeutic program that helps individuals, along with their families, develop an individualized, comprehensive plan aiding the participant in regaining as much independence as possible. We help families by providing information referral and a compassionate support system. The Brain Benders program sees beyond the disability and helps the client take back some control in his or her life. Cognitive training consists of a variety of exercises designed to help improve functionality in areas such as sustaining attention, memory, thinking before acting, visual and auditory processing, listening and reading. The principle behind cognitive training is to help improve the "core" abilities and self-control necessary before an individual can function successfully academically. Goals and objectives are established with each individual we serve and are directed towards the achievement of lasting outcomes. 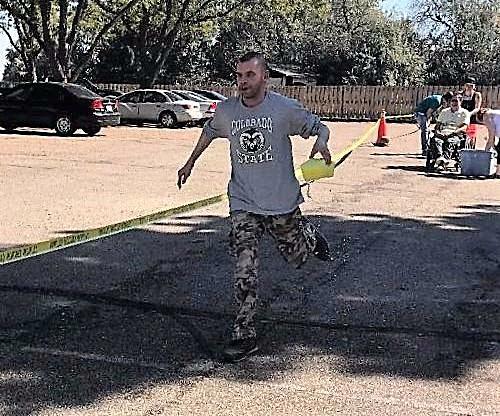 Personal goals and objective plans include: personal care, meal preparation, money management, community navigation, socialization, household management and resource coordination, problem solving skill development, physical fitness program, and psychological/behavioral adjustment. Group work consists of weekly support meetings, cognitive training activities, and music therapy. Group work also covers learning how to use public transportation and working together to find the best way to destinations in the community. Mini and major victories are reached when each individual realizes his or her limitations and finds ways to overcome them on a daily basis. 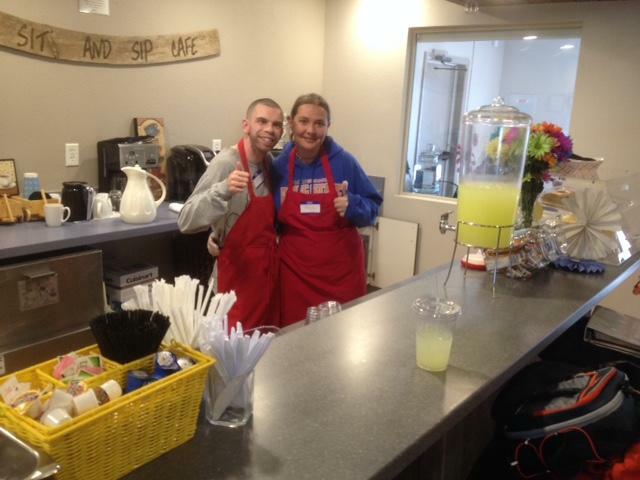 Ted's Sit and Sip Cafe, named in honor of one of our all time favorite supporters, is open for business and welcomes your visit. Run by our Brain Benders group, the cafe is open from 8:30 to 10:30 Tuesday, Wednesday, and Thursday mornings. Come have a quick snack, visit with our folks, and support our program with your donation for the food. We'd love to see you! Every month, a local restaurant in Northern Colorado offers to give a portion of the tab back to Elderhaus for those presenting a flyer to their server. 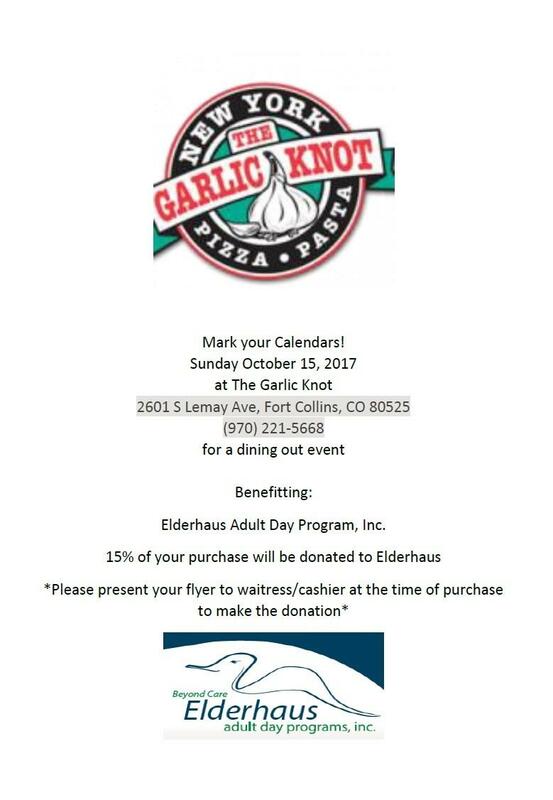 On October 15, The Garlic Knot at 2601 S Lemay Ave, Fort Collins, will be our sponsor. Please click on the image at right to access a printable flyer to bring with you. Come enjoy some pizza with friends, and support Elderhaus at the same time. Watch our website for upcoming events at other restaurants around Northern Colorado. Dance Express presents Dance Beyond the Limits, October 7, 9:00AM to 4:30PM at Club Tico, 1599 City Park Drive, Fort Collins. Windsong Memory Care presents Dr. Cameron Camp speaking on The Montessori Inspired Lifestyle, A Positive Approach to Dementia Care on Wednesday, November 8 at 6:30PM at the Lincoln Center, 417 W. Magnolia Street, Fort Collins. Elderhaus offers an ongoing caregiver support group meeting from 9:00 AM to 11:00 AM on Wednesdays at Elderhaus. Anyone going through difficult transitions with a loved one is welcome. Please join us. The Larimer County Office on Aging maintains a community announcements page for resources related to aging and disabilities. Please click here to access the current list. Contact Joanne if you would like to be considered for a board member position.